The Numato Lab XO-Bus Lite is a framework for communicating with Numato Lab boards such as Saturn, Neso, Skoll, Styx etc from a host. XO-Bus Lite accelerates the development by providing an intuitive way of transferring data into and out of the FPGA. 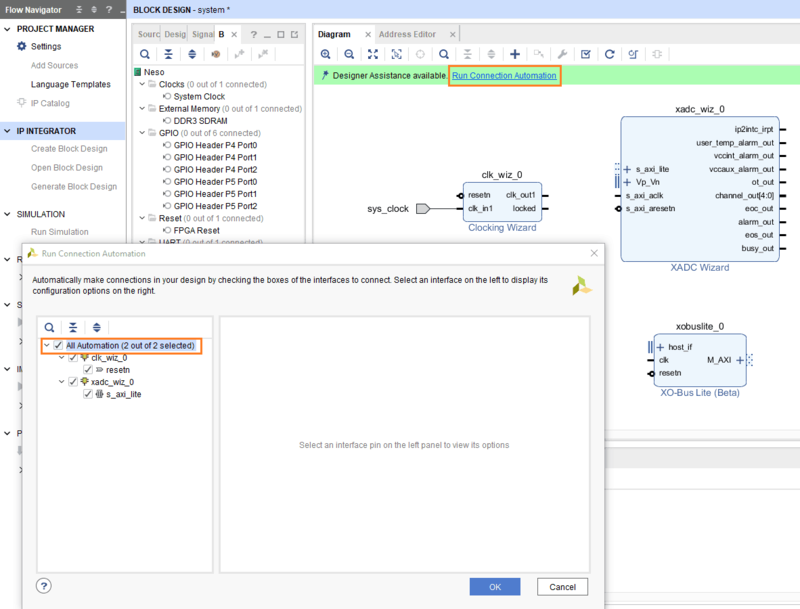 The XO-Bus Lite framework acts as a standard AXI4 Memory Mapped Master, and it can control AXI4 compliant slaves and use existing AXI4 infrastructure provided by Xilinx Vivado. This feature itself makes XO-Bus Lite Framework very powerful. Users can use most, if not all, IP cores that support AXI interface and read/write to memory and memory mapped registers on the devices directly from host PC. There is no need for any microprocessor (such as Microblaze), though XO-Bus Lite can also work alongside Microblaze or any other AXI Master. This gives users a high degree of flexibility in their designs. 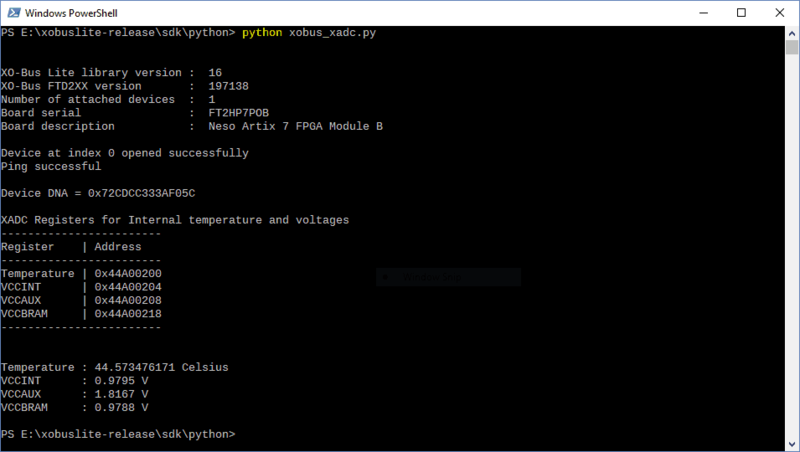 This article will demonstrate how to use XADC Wizard IP core with XO-Bus Lite to read FPGA temperature and voltages using Python. Familiarity with the Vivado Design Suite and its IP Integrator flow and XO-Bus Lite is also necessary to follow this article. The article uses Neso Artix 7 FPGA Module for illustrating the steps, but similar steps are applicable for Skoll Kintex 7 FPGA Module and the Styx Zynq FPGA Module. Download and install Vivado Board Support Package files for the Numato Lab boards from here. Follow the README.md file on how to install Vivado Board Support Package files for Numato Lab boards. 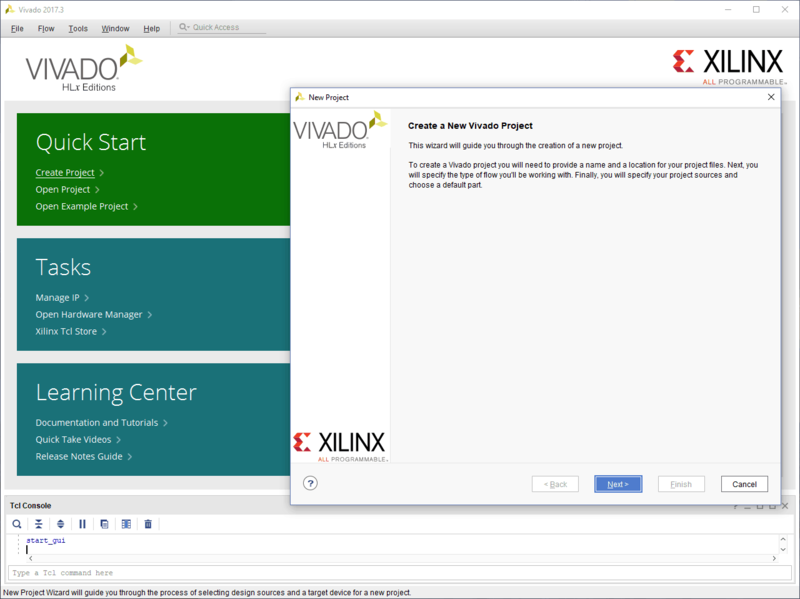 Open Xilinx Vivado Design Suite. Go to “File -> “New Project…”. The “New Project” wizard will open. Click “Next”. 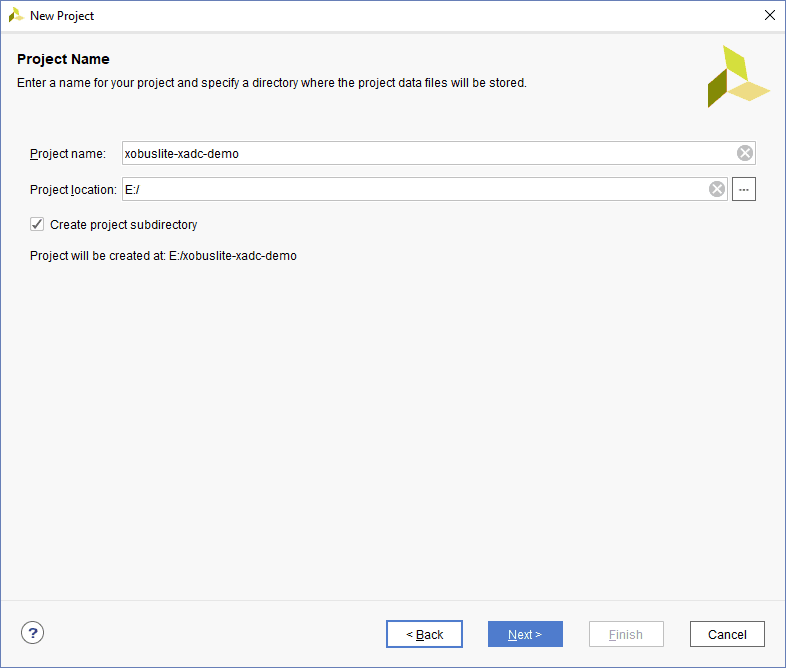 In the “Project Name” step of the “New Project” wizard, enter a name for the project and select a location of your choice. Click “Next”. 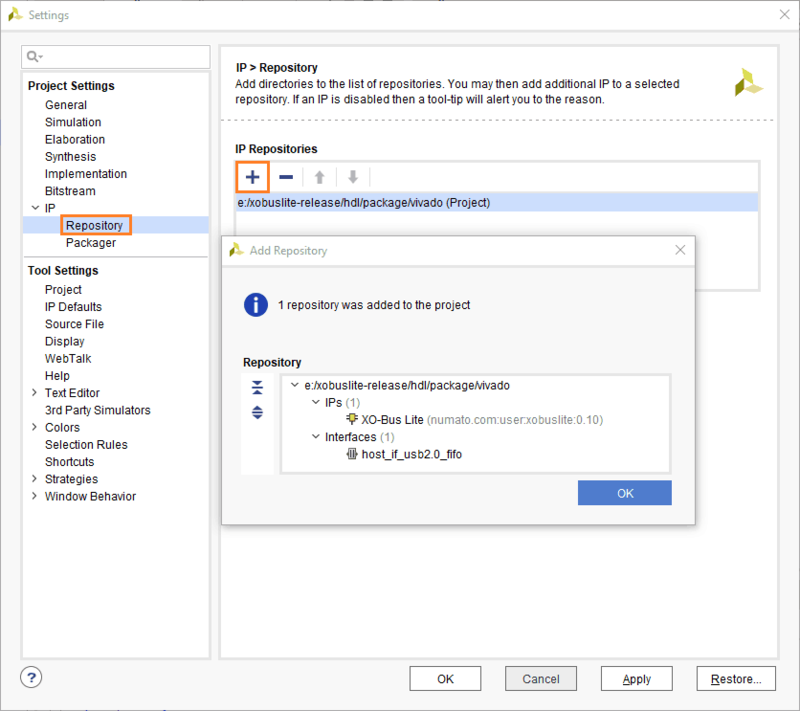 In the “Project Type” step of the “New Project” wizard, select the type as “RTL Project”, select “Do not specify sources at this time” and click “Next”. 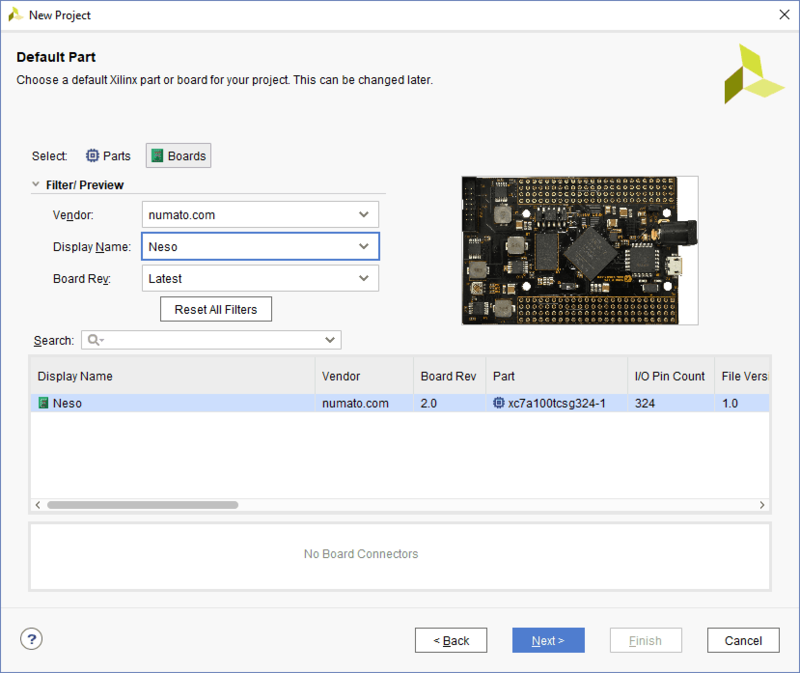 In the “Default Part” step of the “New Project” wizard, go to “Boards” tab and select Vendor as “numato.com” from the list. Select Neso, or Skoll or Styx as applicable. That is, if you are using Styx for following this article, select Styx from the list. If Neso, Skoll and Styx are not listed, make sure board support files are installed correctly. Click “Next”. 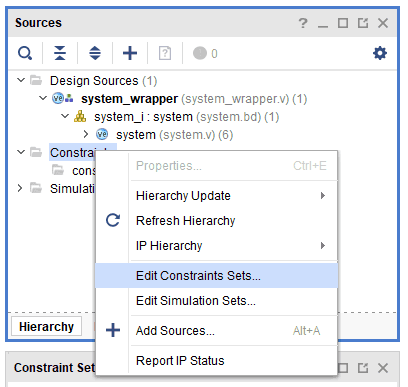 Review the project configuration in the “New Project Summary” page and finally click “Finish”. A new Vivado project will be created with the selected project options. 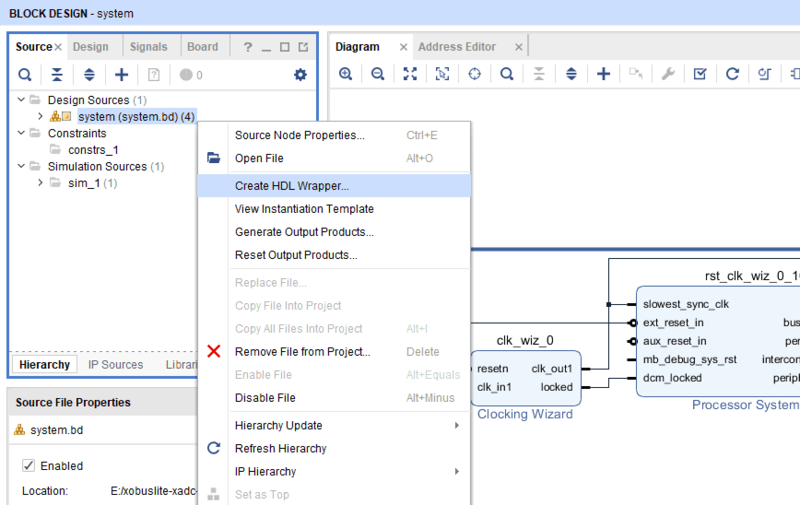 Go to “Flow Navigator” on the left side of Vivado window and click “Create Block Design” under “IP Integrator” section. Enter a name for the block design and click “OK”. 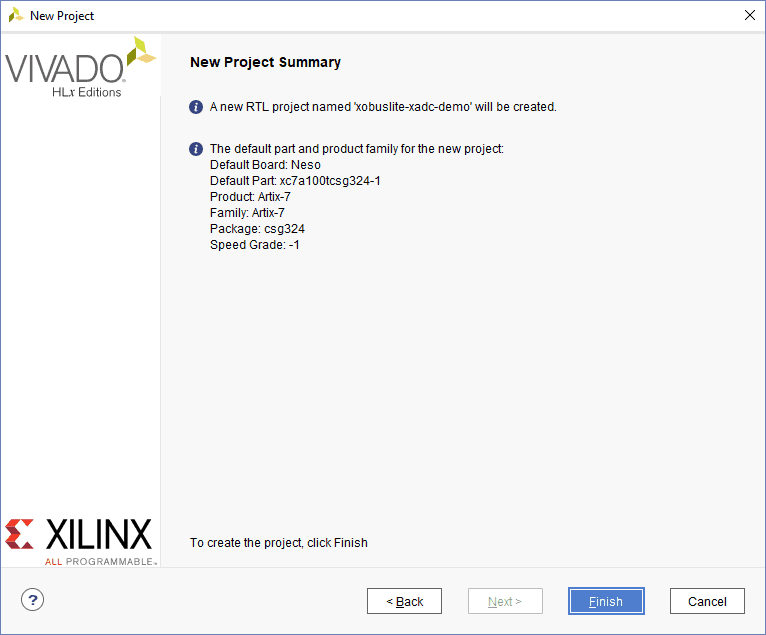 The XO-Bus Lite IP repository needs to be added to Vivado so that XO-Bus Lite can be used with Vivado’s IP Integrator. Go to “Settings” under “Project Manager”. In the “Settings” dialog window, go to IP -> Repository page and click “+” icon. 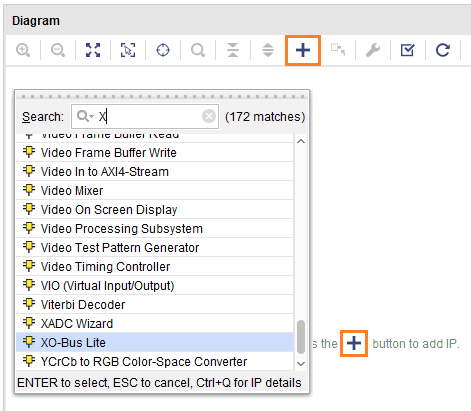 Browse to the location of the XO-Bus Lite IP Package and click “Select”. Vivado will scan for IPs available in the selected location and display the confirmation that it found 1 IP and 1 interface in the selected repository. Click “OK” to close the confirmation dialog window. Again click “OK” to close the “Settings” configuration window. Click “+” icon on the toolbar of the Block Design Diagram Window. 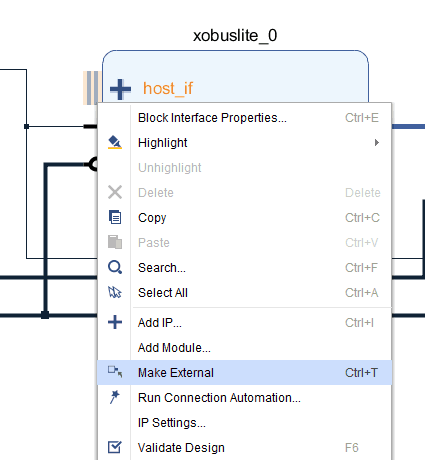 Search for XO-Bus Lite from the list and double click to add XO-Bus Lite IP to the block design. From the “Board” tab of the Block Design window, drag and drop “System Clock” into the block design. 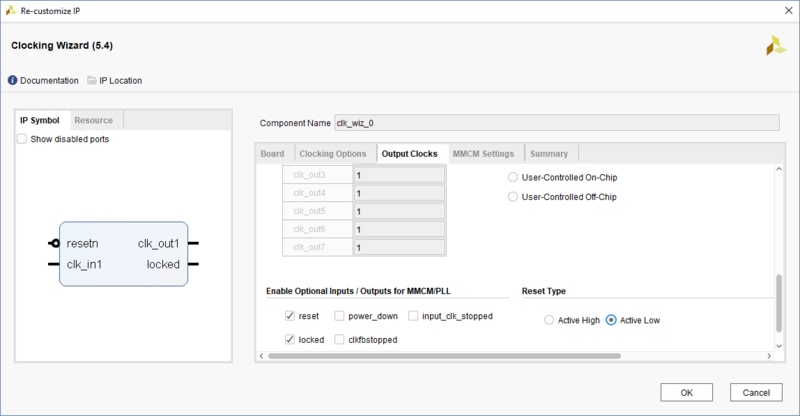 Double-click the “Clocking Wizard” IP block, go to “Output Clocks” tab and select “Reset Type” as “Active Low”. Click “OK” to close the IP customization window. Similar to as in Step 7, add “XADC Wizard” IP core to the block design. Click “Run Connection Automation” from the green bar on top of the block design. Select “All Automation” in the “Run Connection Automation” dialog window as shown below and click “OK”. Vivado should automatically connect the blocks. Right-click on the “host_if” port of the XO-Bus Lite IP block and click “Make External”. Rename the external port back to “host_if” in case Vivado appends any extra characters in its name (such as “host_if_0”). Change to “Address” tab in the block design window and note down the base address of XADC Wizard IP core. This address will be used for the variable XADC_BASEADDR in the Python test code xobus_xadc.py in the last step of this article. 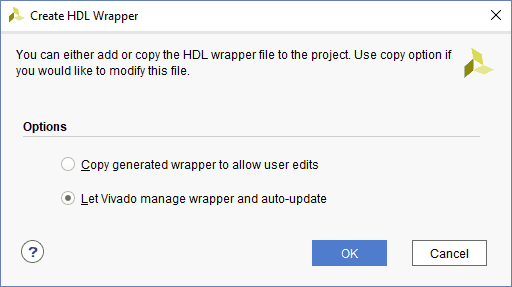 Opt to “Let Vivado manager wrapper and auto-update” and click OK.
Once more, right-click on the “system” block design and select “Generate Output Products…”. 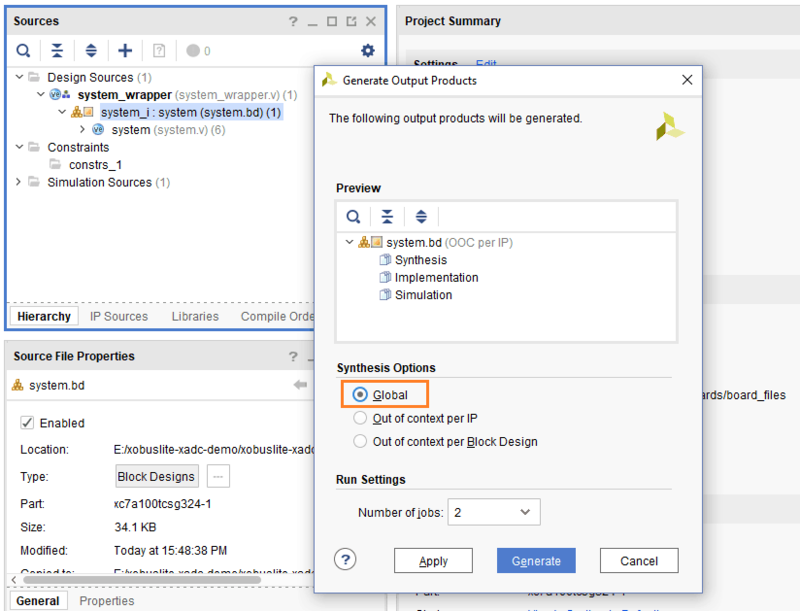 In the “Generate Output Products” dialog window, select “Global” synthesis option. This step is important. Click “Apply” and then “Generate”. 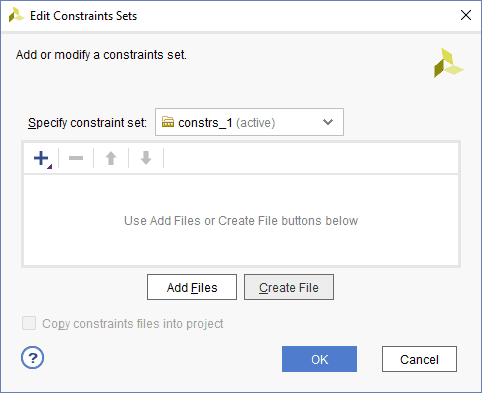 Click “Create File” in the “Edit Constraints Sets” dialog window. Enter the file name of the constraints file as “neso_xobuslite.xdc” and click OK twice. 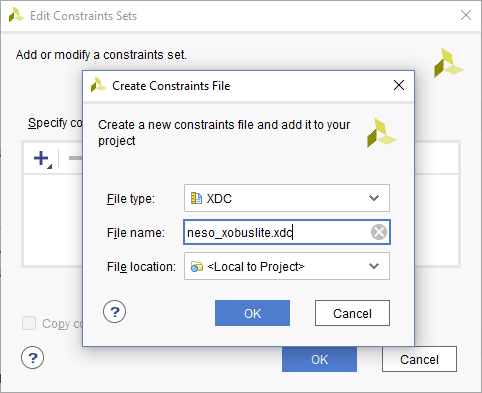 Open the newly created constraints file “neso_xobuslite.xdc” in the Vivado editor and copy-paste following contents into it. Save the constraints file. If you are using Skoll or Styx instead of Neso to follow this article, change the constraints correspondingly. Make sure that Channel/Port B of FT2232 on Neso is configured as 245 FIFO. If in doubt, follow the steps under “Driver Installation” section of the article “Getting Started with XO-Bus Lite Framework” to configure Neso correctly for XO-Bus Lite. 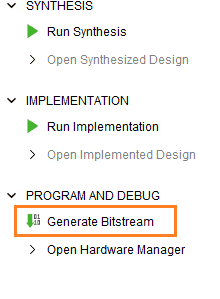 Once the bitstream is generated, program the bitstream to Neso using JTAG or Neso Configuration Tool. 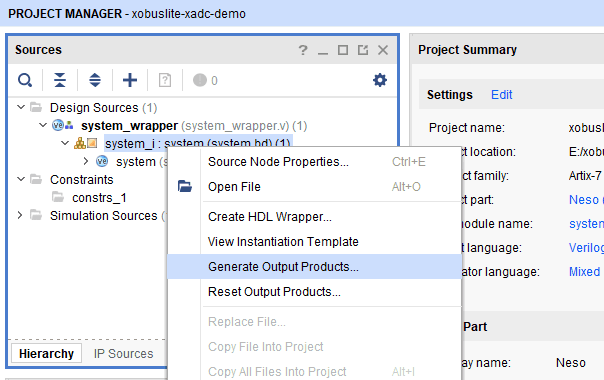 Browse to xobuslite-release\sdk\msvc\lib\amd64 and copy xobus-lite.dll. Create a new folder named bin inside xobuslite-release\sdk and paste the DLL in that folder. The final path of the DLL should be xobuslite-release\sdk\bin\xobus-lite.dll. Open Command Prompt or PowerShell in the folder xobuslite-release\sdk\python and run python from this folder. Try following commands in the python. If any of the below commands give error, it means the XO-Bus isn’t set up correctly. Congratulations! You have successfully read FPGA temperature and core voltages using XO-Bus Lite and Python. The Python library makes it very intuitive for people to experiment with the hardware using REPL Python shell. Keep exploring!